Tilly the Yorkshire Terrier x Cavalier King Charles (Blenheim) Spaniel cross—"My beautiful Tilly is only around 8" tall and around 14" long. Unfortunately my male, Duke passed away and although they were not bought as brother and sister, they were alike with being crossed with Yorkies and Cavvies, same colour. We bred 2 litters with them and they were all sold at 3 weeks old, none of the buyers backed out and they are still with their loving families now. Tilly is 4 years old and is very loving and affectionate. She keeps herself to herself and only barks at the door. She was housetrained within 3 days of having her, and I have never had to confine her when I leave the house since I got her. Even when she was a pup she was well behaved in the living room so I gave her the run of our house, but only downstairs. She is happy all the time but she has very expensive taste in food; only the finest will do, but I have to keep changing it as she goes off it easily. A lovely little dog, I got her when she was 9 weeks old as our little rescue dog Duke, who was the spitting image of Tilly, passed when he was 4 due to a heart condition. Tilly has been the calmest, happiest, loving, loyal dog I have ever had in my life. She is comfortable anywhere and with anyone, including small children. She has never growled or bitten and I hope she will stay that way." The King Charles Yorkie is not a purebred dog. 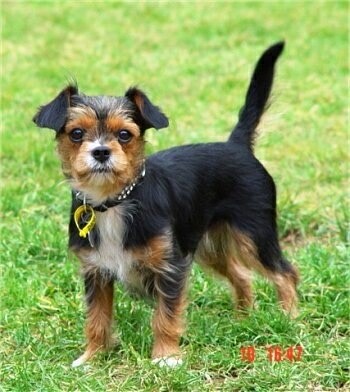 It is a cross between the Cavalier King Charles Spaniel and the Yorkshire Terrier. The best way to determine the temperament of a mixed breed is to look up all breeds in the cross and know you can get any combination of any of the characteristics found in either breed. Not all of these designer hybrid dogs being bred are 50% purebred to 50% purebred. It is very common for breeders to breed multi-generation crosses.